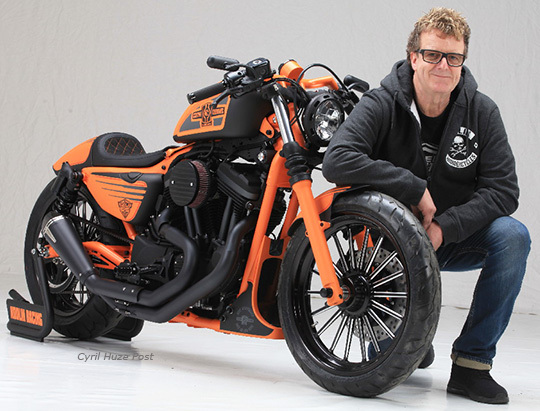 Fred Kodlin Just Unveiled A New Custom Sportster At Italy Motor Bike Expo. Published by Cyril Huze January 20th, 2017	in Builders, Customs and Editorial. At 10 am local time this Friday morning, the 2017 Italy International Motor Bike Expo (MBE) started to welcome the 160,000 expected visitors eager to see all weekend the new manufacturers’ models, to visit the more than 600 exhibitors and the 4 halls dedicated to the custom motorcycle industry. A huge exposure for all builders who traveled to Verona to show their new creations. First in line to unveil his new project was Fred Kodlin with this Sportster 1200 commissioned by Custom Chrome Europe for their yearly “Bolt-On And Ride” program. 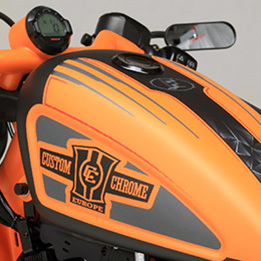 This program includes 5 custom bikes built by some of the best builders, all working with complete freedom of style but being required to use parts distributed by CCE. Particularity of this “Bolt-On And Ride” program is that each of these bikes is available all year long to members of the press for evaluation with real life road testing. 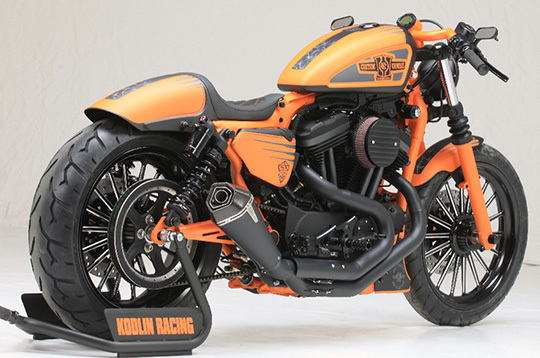 Some may be very surprised to see the name Fred Kodlin associated with a custom Sportster. These last years Kodlin, with his co-designer and co-worker son Len, had focused his efforts on very radical baggers (yes with tall front wheels), and of course on the creation of custom parts to fit them. But those who, like me, know him since a very long time have seen him build many top creations based on all main models of the Harley line. As a matter of fact, and little known by Americans, Kodlin has already released a few months ago during Intermot a complete line of stylish bolt-on Sportster components now distributed by Custom Chrome Europe, with some of them featured on this new Sportster 1200 project. 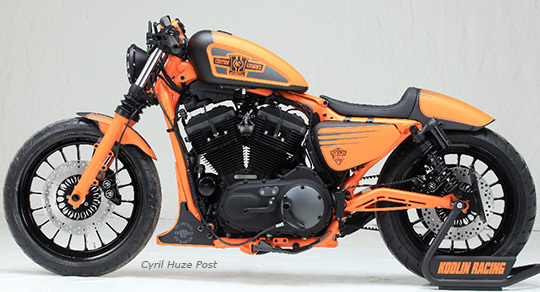 Fred Kodlin’s interpretation of this Harley model implied a full scale makeover. 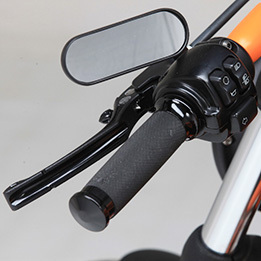 Although, per “Bolt-On And Ride” rule, the factory frame can’t be altered, bike stance was changed with a new set of wheels replacing the 2 factory 16”. In front was installed a RevTech Nitro Black 19 x 3” and in the rear a wide RevTech Nitro Black 18 x 5” with matching 11.5” disks, and respectively dressed in Pirelli “Night Dragon” 120/70 ZR 19 and Pirelli “Night Dragon” 180/55 ZR 18. 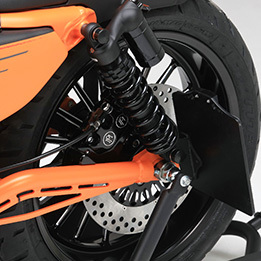 Such a wide rear wheel required the fitting of a new Kodlin proprietary swingarm that can be swapped on all 2004-up rubber mounted Sportsters and able to accept a 200 mm wide tire. Suspension was upgraded with a set of black Progressive Suspension 970 Series shocks. Bodywork was modified using Kodlin’s “Racing” rear fender (there is also a “cafe Racer” version), a front fender from CCE TXT and an “improved” Sportster tank also from CCE that has been fitted with an Arlen Ness pop up gas cap. 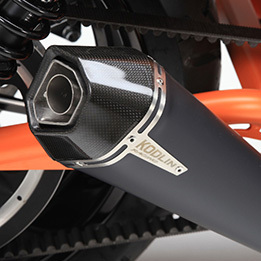 Handlebars are a Kodlin creation already used on many of his projects. 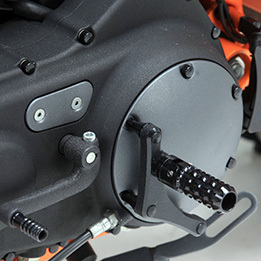 They are of the type 1-piece bar/risers, made from solid steel due to their custom application also on heavy bikes, with a design inspired by the moped sport bars of the 70’s. 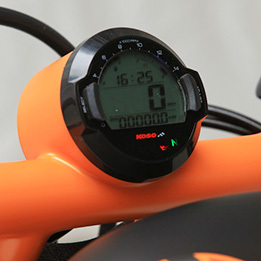 Speedo housing was welded to these bars. Beautifully done and love the paint scheme. I’m sure several on here will find faults but I love it. Very nice. Cyril are you in Verona? The more I look at the subtly unconventional artwork, the more I like it it. Beautiful bike! With it’s resources, it’s hard to understand why HD doesn’t build factory bikes like this from the get go. They’d sell tons of these. 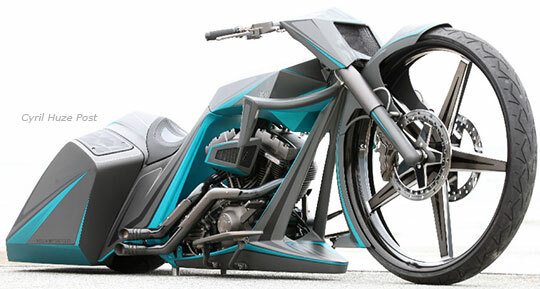 Can you imagine if Victory built bikes similar to this? Beautiful Sportty. 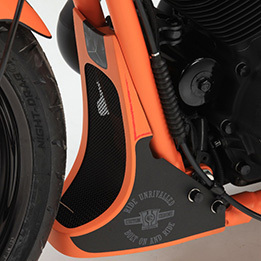 Like the swingarm and the matte paint job. Beautiful bike. Sporty’s in general are great-looking, but geez, they’re terrible bikes. Tiny, gutless wonders. It never ceases to amaze me how many builders take this inferior platform to invest all of their time, talent, and money into. Sportsters make great platforms for customising , from flat trackers to long bike choppers their compactness and clean lines are ideal. 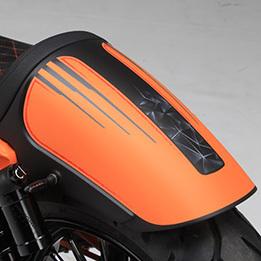 That bike is great and the paint looks clean but is quite detailed. I have ridden some sportsters that have been “breathed on” and they were quick. Takes very little and the power to weight ratio is what matters. Spaz – I think the guys dirt jumping sportys from Rusty Butcher would beg to differ.lol Stock 883s are underpowered sure, but so are all harleys. Do them up right and they rip. Tasteful, and looks rideable. Sporties are a great bike, very much overlooked by the vast majority. Doesn’t take much to make them quick(er). Too bad the big twins don’t have the same type cam set up, with gears……. to not look at it ,master peace. Hasn’t been a bike built by Fred that I haven’t loved. Would have preferred it more “naked” but pretty good. Well done. Don’t like the colors, but not Kodlin’s fault. Pricey, i guess. Not worth it to spend so much on a Sporty. 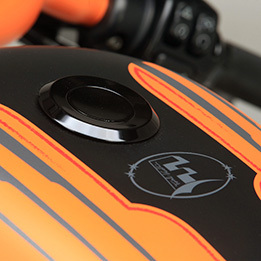 But it’s a promo bike for CCE…. Not crazy about F. Kodlin style but it’s well built. 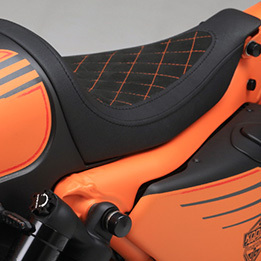 this bike highlights the sporty’s iconic look. h-d corporate is lucky to have preserved it. the polaris vic didn’t have such a signature imprint. the scout kinda does, though in a quite different class. enuf to carry the brand for polaris? i dunno. i doubt it in a fragile moto market. 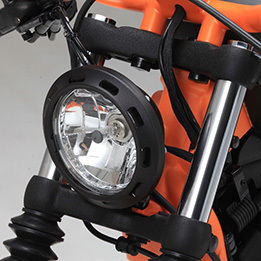 After victory made that new Model Octane to compete with Sportster, I would not even think of a Sporty. 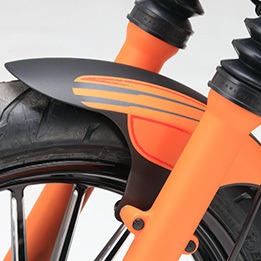 I like the overall design of the bike, just not real wild about the orange frame. I love this bike. What is not to love!!! Bigalyts – You’re talking about that re-badged scout right? I’ll take a sporty any day over that mess.